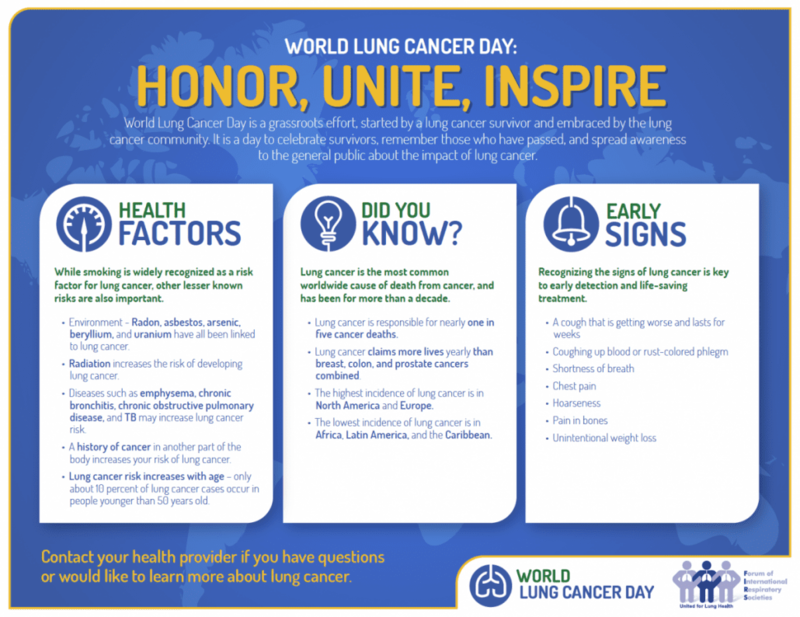 Occurring annually on August 1, we celebrate World Lung Cancer Day. What began by a lung cancer survivor is now a grassroots organization that’s been embraced by the lung cancer community. Much like other cancer organizations, today celebrates the survivors, the progress made in treatments, but also to spread awareness and knowledge to the public and to remember those who passed. One major push of World Lung Cancer Day is understanding and broadening pubic perception of what causes lung cancer. Smoking is one of the most widely recognized risk factors, but many others exist. Environmental factors like exposure to asbestos, arsenic, radon, and uranium have been tied to lung cancer, as has exposure to radiation and the presence of diseases like chronic bronchitis, tuberculosis, emphysema, and pulmonary disease, too, have been linked. Furthermore, a history of cancer in other parts of the body have impacts on your chances of getting lung cancer, as does your age – only 10% of lung cancer cases are in individuals younger than 50 years old. For the last decade, lung cancer has steadily been the world’s most common cancer that leads to death. Combining the numbers of lives claimed via colon, prostate, and breast cancer is still lower than the lives lost to lung cancer. Europe and North America have the highest number of cases and the Caribbean, Latin America, and Africa have the lowest numbers. Just like other cancers, detecting the presence as early as possible greatly increases the chances of effective treatment. Symptoms include worsening, weeks long cough, blood or rust-colored phlegm being coughed up, as well as pain in bones, unintentional weight loss, as well as shortness of breath and chest pain. Lung cancer is also, unbeknownst to most, more deadly to women than men. Though breast cancer is twice as common as women, the cure rate is much lower for those with lung cancer. Night sweats occur in both men and women much more often as a symptom of treatment than of the cancer itself. While 16% of all cancer patients experience night sweats as a result of the cancer, with lung cancer that number is higher during the treatments themselves. Today, we celebrate the progress, remember the lives lost, and seek to expand the knowledge of lung cancer. The cachet that surrounds lung cancer is the idea of the typical older male lifelong smoker. However, this is far from the norm and thinking of lung cancer solely as something only certain people are subject to hinders treatments. Online support groups and other cancer information can be found here. Talk to your doctor if you have any health concerns. As always, sleep well, sleep wicked.